Do you take advantage of cashback on your spending? Do you know the best cashback sites? 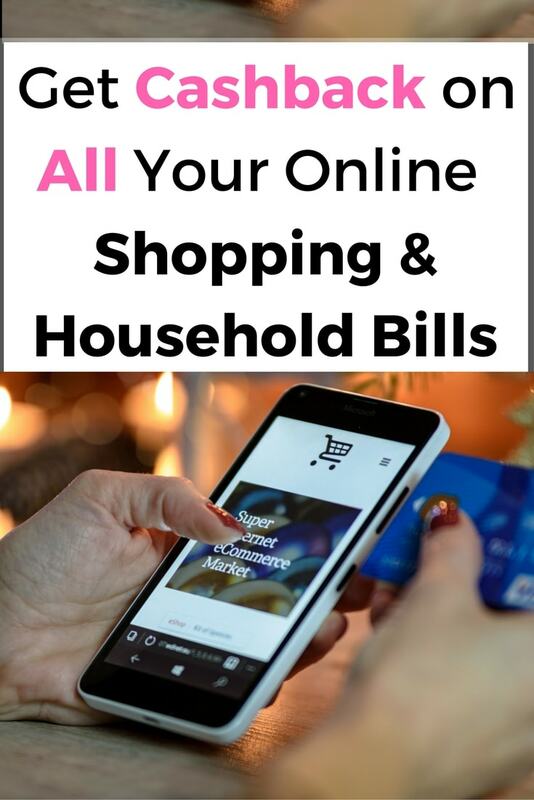 If not, how would you like to save money on almost all of your online shopping and household bills? Literally, everything you can spend money on possibly offers cashback. These cashback savings can add up to hundreds of pounds a year if you use the best cashback sites! Plus it’s so easy to get. Without a doubt using cashback sites should be an automatic inbuilt habit for anyone looking to save some money on their outgoings. In addition to savings, you can even use cashback sites directly to make a little extra income on the side. There are 2 main and easily the best cashback sites. Ideally, you should sign up to both. They are totally free and will both save you money that you can later have going back into your bank account. Quidco – (sign up via my referral link ). Which is the best Cashback Site: Quidco Or TopCashback? Between these 2 main best cashback sites, you can get cashback on almost all your online expenditure. They offer cashback on almost every online expense, (sometimes even in stores). Quite often when both Topcashback and Quidco have a cashback deal with the same company, Topcashback offers a marginally better rate. However, this isn’t always the case, so I always check both. I have actually earned more cashback from Quidco. This is mainly due to 2 deals in particular that paid cashback ranging from £70-£160 each, that weren’t available on Topcashback. The cashback site simply acts a referral to the business you click-through to. The cashback site will be paid a commission on any purchase you go on to make. When you click from one site to another, things called cookies are used on your device which tells websites where you have come from. The websites may have an agreement whereby the referring sites get paid commission for any sales. The cashback site is earning commission on your purchases and is simply giving a percentage of this commission back to the user. To track your own cashback, before you make a purchase, you simply log into your cashback account and then click-through to the site you intend to spend money and carry on as normal. Any purchases you make will get you cashback. You’ll see them registered in your cashback account within a few hours, or sometimes a couple of days. Cashback sites are totally free. In fact better than that, sometimes they actually pay you to sign up. They do sometimes offer premium options and it’s totally up to you whether you pay a little extra. What can you get cashback on? What do you spend money on? Pretty much every expense you make could potentially offer you cashback. In some instances, you don’t even need to spend any money to get the cashback! Cashback on Goods – Clothing, fashion, gadgets, foods, cosmetics and fragrances, electrical goods, literally everything. Travel – Your actual holiday as well as car hire to booking a ferry or flight for your holiday. Days Out. Insurances – Travel, car, home, breakdown, life, pet every kind of insurance. Commission: You may get from 1 – 40+% back on your spending. The commission rates for each individual offer are constantly changing. A Fixed Cashback Fee: With this option, you get a set price for spending or taking out a service. For example £25 for opening a bank account. Or £40 for switching energy via a comparison site. Cashback often tracks quickly, but actual payment of the cashback can vary considerably. Some will pay within days or weeks. Others may take months. At the cashback you can see some sort of progress, typically tracking, pending or paid. Will I always Get paid the cashback? In the vast majority of cases, you will receive the cashback. If a sale doesn’t track or you don’t get your cashback there are procedures with each cashback site you can follow to chase them up. I have been paid for pretty much all the purchases I have made. The times I have not have been, have been when I was maybe signing up to an online casino. I was hoping to get the cashback as an added extra, but half expecting to maybe not get it because the terms may have conflicted with another offer on the actual website. How Do I Get Paid the Cashback? It will vary depending on the cashback site, but they typically allow you to withdraw the cashback to your bank or Paypal. You can sometimes choose to receive some of the cashback in-store vouchers, usually at a top-up value, ie 10% extra in vouchers instead of taking cash. How Do you check for a cashback deal? My quickest method for checking for cashback is to start with Google. I’ll just type for example “Argos cashback”. 9 times out of 10 a link to Topcashback or Quidco will be very high in the search engine results. A quick click-through to each and I can see who offers the best deal. Alternatively, you could visit both sites and use the respective search boxes directly. As well as more ways to get cashback, once you have earned some you can get even more. Topcashback have an option where you can trade your earned cashback for a higher value in vouchers. These will be for well-known retailers such as Amazon or Marks and Spencers etc. So your £100 cashback might be worth £120 in vouchers! Quidco offer similar, you can trade your cashback up 5-10% more in vouchers. Although they had less selection of stores to choose from, it’s still an option worth checking. Savvy Extra Saving Tip: Sometimes you can get a 15% or more boost on your cashback by having it paid out to Zeek. You could then use it to make even more savings by buying gift cards from your favourite brands below face value. Somestimes 10-20% off! Download the app to your phone and take advantage of stores which offer instore cashback. TopCashback has a Free Cashback page. Listed will be a range of deals where you will get paid for actions. These might be to visit a comparison website to compare car insurances or sign up to a dating website, or free lottery website. Just make sure, as with any kind of trial deal, that you don’t commit to a direct debit payment. If you do and it’s fully worth the cashback, make sure you set a reminder on your calendar or alert in your phone to cancel it in time. The vast majority of cashback gets paid simply by visiting the site via the link from the cashback site you are signed into. If I’m making a large purchase that will make me £10+ in cashback, and I have even the slightest concern that I may have visited the site I’m purchasing from previously, I will clear my cookies or use another web browser to start my purchase from the cashback site. Then click-through to the retailer. Just making double sure my cashback is tracked and the cookie isn’t crediting my purchase to another source. I always assume there’s a chance I won’t get my cashback. So I wouldn’t book my holiday through one company purely because of the cashback. I look first for the best all-round deal for my holiday, then look to see if there is a cashback deal to pay via afterwards. Obviously, it could also be worth looking first to see if there are any holiday cashback back deals that stand out on the cashback site and bearing those in mind when holiday hunting. After all, for a large expense like a holiday, the cashback could be hundreds of pounds. We chose a family holiday for 2014. Only when we had made our decision did I check for cashback. £160.44 cashback for Easy Jet Holidays, on the holiday I was going to book anyway. Paid for a few extra beers and Sangria! Be careful combining other offers, voucher or promo codes with cashback as one may cancel the other out. You may not get the cashback. Never take it for granted. Savvy Extra Saving Tip: Kidstart –Sometimes I use on the rare occasion a major retailer is not linked with Topcashback or Quidco. For example, there have been times John Lewis and Amazon have only been available through kidstart. Sometimes Amazon is on the other 2 cashback sites, but it might only be for certain departments. Whereas, up until now, I have always got Amazon cashback on every item at kidstart. Bearing in mind both Amazon and John Lewis alone sell such a wide range of products at good value prices, getting cashback on top ensures you are getting the best deal possible. The main cashback apps don’t offer a lot of opportunity to cut the cost of the weekly food shop. However, there are a couple of good apps which offer savings on a small range of products. Sometimes giving away the item for free. You would typically have to purchase it first and claim cashback through the app later. Shopmium is an easy to use app that you check before you go food shopping to see if your local stores are offering any free food items or good discounts on items you’d wish to buy. Firstly, you purchase the item at the store. When you get home, scan the barcode of the product and your receipt using the camera functions within your phone and your cashback is claimed. Minimum payout is just 1p. Read my full Shopmium Review to see how it fully works and to claim your first freebie. Check the other offers too as there might be more free items amongst the other discounts. Use my referral code: n3uz2 (thanks if you do and enjoy your free item). Savvy Money Making Tip: For those of you who don’t already know, Matched Betting is one of my favourite sources of extra cash every month. Matched Betting is not gambling. It’s a way of totally legitimately method for exploiting and profiting from the many free bets and related promotions bookmakers offer. Gambling Deals is an additional cashback option for Matched Bettors. Assuming terms don’t conflict with the offer, you can sign up to the bookmaker or casino through Gambling Deals and receive either a one-off payment of monthly cashback on any losses at a bookmaker if your matched bets win in the betting exchange. I have received hundreds of pounds cashback from this option alone. Signing up to BOTH TopCashback and Quidco is a no-brainer. They will both save you pounds. The more spend the more you will save. Plus everyone has bills rights? So why not save more on them. For more information see my full TopCashback review for a more in-depth look at promotions and tips to get more cashback as well further make it go further. If there’s anything more you’d like to know, or you have any further tips, please share. Share this article with friends and family who could also benefit from cashback, by all means, include your own referral link.